Glapwell maintained their place at the top of the league with a 7-0 victory at bottom-of-the-table Welbeck Welfare. Josh Parfitt’s five goals took his tally for the season to 22 and was also his third successive hat-trick. Other than an early scare when Robbie Savage very nearly gave Welbeck the lead, this was a very much routine victory for Glapwell. It could have been an even bigger win with Glapwell having three goals disallowed for offside as well as being denied by the woodwork on three occasions while Welbeck keeper James Rice made several excellent saves. Josh Parfitt scored twice in a minute to give Glapwell the early advantage when he tapped home the first before converting a penalty just moments later after Sam Bartram had been fouled in the area. He completed a nine minute hat-trick when he guided an header inside the far post. Adam Kimberley made it four just after the break when he fired into the bottom corner before Parfitt added his fourth, and Glapwell’s fifth, just before the hour when he rounded the keeper before slotting home. 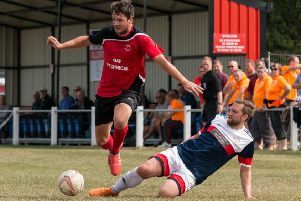 Tom Norris capitalised on a poor clearance to score Glapwell’s sixth before Parfitt added his fifth from the penalty spot four minutes from the end to round off a fine afternoon for Glapwell, and him personally. Glapwell remain top of the league after an eighth straight league victory which also maintains their 100% league run on the road this season with seven from seven so far.